16 Merchants Court01263 715779work01603 870304fax Self-cateringBuckets and spades at the ready! 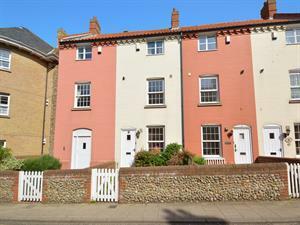 Split over three levels, this pretty cottage is in one of the most perfect spots for a holiday at the seaside. Commanding an enviable location, 16 Merchants Court, stands at the top of a slip-way which leads directly on to Cromer beach, you can reserve the best spot first thing in the morning ready for a days fun building sandcastles and swimming in the sea! Aside from the sandy beach there is plenty for families to do. Take a look at the RNLI Lifeboat House which is located at the end of Cromer Pier, or the RNLI museum on the promenade houses a disused lifeboat, offers interactive learning, and accounts from past crew members. For a fun family outing visit the Pavilion Theatre for the summer variety show 'Seaside Special', purchase bait from one of the local shops and try 'gillying' for crabs, or take a net to the rock pools and hunt the 'Kiddywitches' (small crabs) when the tide is out. For those wishing to explore a little further afield there are an abundant of pretty villages and neighbouring towns close to Cromer. Take a walk along the North Norfolk Coastal Path, passing through delightful Sheringham, and end up in picturesque marshlands of Cley and Blakeney. For train lovers you can ride from Cromer along the Bittern Line to Sheringham and hop on a steam or diesel train and travel along the Poppyline into the Georgian town of Holt. Cromer is historically referred to as the 'Gem of the Norfolk coast' - whilst you may not find any actual gems here, you are sure to have a holiday making memories to treasure! Buckets and spades at the ready! Split over three levels, this pretty cottage is in one of the most perfect spots for a holiday at the seaside. Commanding an enviable location, 16 Merchants Court, stands at the top of a slip-way which leads directly on to Cromer beach, you can reserve the best spot first thing in the morning ready for a days fun building sandcastles and swimming in the sea! Aside from the sandy beach there is plenty for families to do. Take a look at the RNLI Lifeboat House which is located at the end of Cromer Pier, or the RNLI museum on the promenade houses a disused lifeboat, offers interactive learning, and accounts from past crew members. For a fun family outing visit the Pavilion Theatre for the summer variety show 'Seaside Special', purchase bait from one of the local shops and try 'gillying' for crabs, or take a net to the rock pools and hunt the 'Kiddywitches' (small crabs) when the tide is out. For those wishing to explore a little further afield there are an abundant of pretty villages and neighbouring towns close to Cromer. Take a walk along the North Norfolk Coastal Path, passing through delightful Sheringham, and end up in picturesque marshlands of Cley and Blakeney. For train lovers you can ride from Cromer along the Bittern Line to Sheringham and hop on a steam or diesel train and travel along the Poppyline into the Georgian town of Holt. Cromer is historically referred to as the 'Gem of the Norfolk coast' - whilst you may not find any actual gems here, you are sure to have a holiday making memories to treasure!